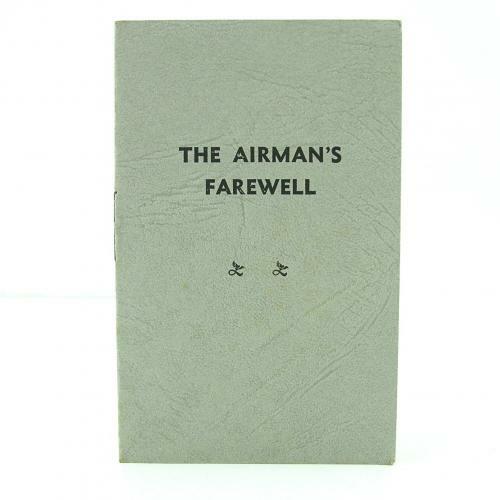 The Airman's Farewell, P/b, 6.8 x 10.7cm, 8p. Published by A. E Bird of the Plymouth Brethren Christian church. Begins ' In a recent issue of the daily press there was related the striking record of a British airman who had been posthumously awarded the Victoria Cross for fearless devotion to duty, in the execution of which he lost his life. Some months before his death he wrote a farewell letter to his mother, to be opened in the event of this happening to him'. This little booklet relates the religious beliefs of the airman that death holds no fear for him and suggests that the reader should also turn to God for similar eternal salvation. A rare poignant and interesting little booklet. The staple has surface corrosion, otherwise in excellent condition. We have a small quantity available. Priced individually. Stock code P21899.